Adam’s hair has reached glorious lengths. He’s starting to consider that he might possibly need to maybe brush it every once in a while, though he’s very resistant to the idea. He… he has really nice hair. I creep on him a bit. With his hair growing at this rate you’ll be able to decorate the whole house with it and brush on all the corners he doesn’t see. Oh, Wheeeeeeeeeeeeere is my hairbrush? 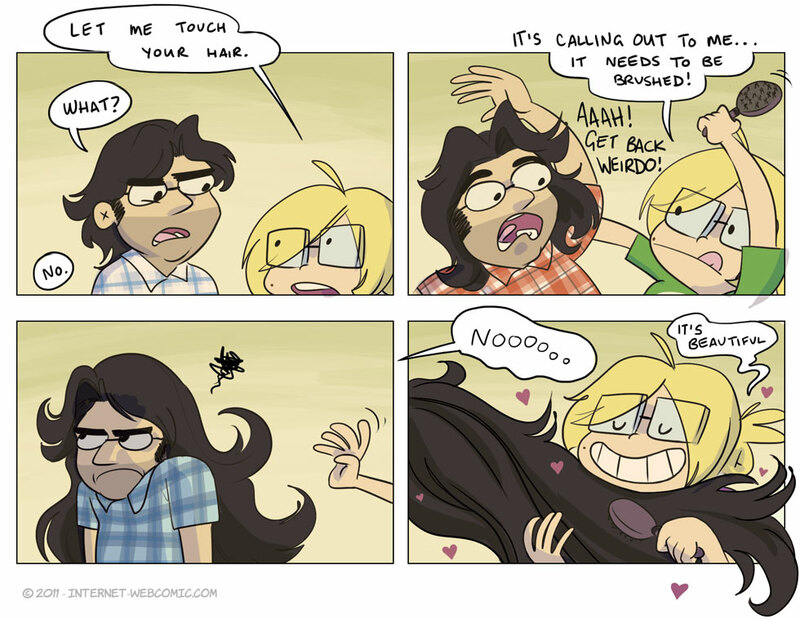 Bwah hah, I know this feeling, my hair is straight and fine and kinda limp and sad. My boyfriend’s is thick, curly, luxurious and long. Creeping commences. As not only a man who is also named Adam, but a man who also has rather long, wondrous mane, I now want to go and flaunt my hair in front of short little blond women to see if this event is universal. I too am a dude with long hair. For most of my adult life I tied it back at work. Now I wear it down all the time and I get way more attention! It gets any longer he can use it as a suit like Bayonetta does with hers. Blue shirt in 1st panel, red shirt in 2nd panel. The sorcery of the brush! It’s because his hair will only grow while he’s changing shirts. Heh, you two remind me of Cecil and Carlos in this one.